It's 10:30 in the morning and they're already heading into the bars. And St. Patrick's Day is three days away. 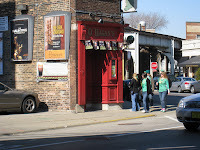 I guess it shouldn't surprise me, seeing how many Irish are in Chicago, but I would be surprised if any of the lads and lassies a-wearin' o' the green I saw this past Saturday morning had a drop of green blood in their veins. I have a weakness. I cannot keep from stockpiling starches. If I see that whole wheat pasta is on sale two for the price of one at the grocery store, I have to buy some. I get twitchy if I have less than one package of brown rice on hand. When World Foods whole wheat couscous were on sale, I bought several boxes through which I am still working. Periodically I will end up with so much on hand that there is no small concern that something will go bad before I can use it. When that happens, I declare a firm moratorium on purchasing any more, no matter how good a bargain it is, and become determined to cook up as much of it as I can in as short a time as possible before I can buy anything more (which I know I will, eventually). Luckily, I love pasta and rice, so it is no big sacrifice for me to use them up. 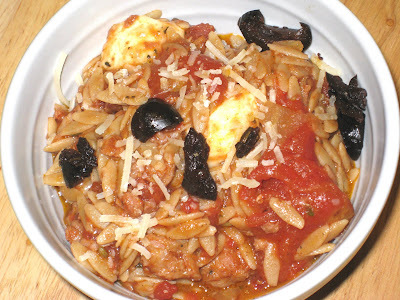 For this whole wheat orzo and Italian Sausage dish, I was also able to find a home for the mozzarella and black olives that were a little too much for my Ultimate Beet Salad. A little red wine added a warmth and richness that made it especially suitable for the colder-than-usual week we just had. This is another dish that travels well, and made an excellent workday lunch. Put a large pot of water on to boil. Heat oil in large skillet. Remove casing from sausage and put it in the skillet. Cook until well browned. Add onions and saute until translucent. Add wine and deglaze the pan; add tomatoes and spices. Bring to a simmer and cook until liquid has reduced by half. When the sauce is about five minutes from being reduced to desired consistency, add salt to the boiling water, and then the orzo. Cook two minutes less than the time given in the package directions, drain, and add to the sausage-tomato mixture. Add mozzarella and mix well. Garnish with cheese and olives.